You are currently browsing the archives for the Recent Announcements category. DANVILLE, VA- The Fund for Halifax County has awarded its seventh round of grants, thanks to the work of the Halifax County Advisory Committee. The committee consists of a few prominent members of Halifax County who wish to see the county grow and prosper. After carefully reviewing the applications received, they chose Halifax County-South Boston Public Library $500 to purchase materials from The Great Courses Collection, Halifax Dog Squad $500 to purchase a partially enclosed shelter and winterize it in order to better protect the dogs in foster care and Main Street United Methodist Church $1,000 to purchase food for the Jane Jones Food Pantry. The committee also chose to award the South Boston Medical Fund in the amount of $990 to the Halifax County Cancer Association to support indigent care in Halifax County. Checks were presented at the South Boston Visitors Center on January 24th. 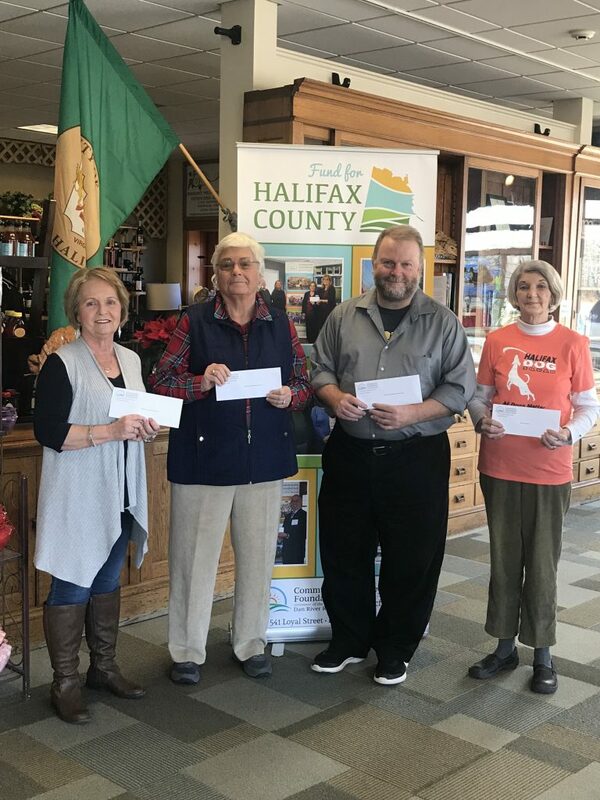 The Community Foundation has awarded more than $16,000 to Halifax County organizations through the Fund for Halifax County, South Boston Medical Fund, Gideon Miller Cancer Fund and Benjamin M. Sugg Fund. The Fund for Halifax County is a unique opportunity for citizens, organizations and businesses to help build an endowment to improve and enrich lives in Halifax County. The Community Foundation hopes to grow this unrestricted fund to enable more grants to be given in the future. The next cycle of online grant applications for The Fund for Halifax County will be taken in August 2019. Anyone can make donations to The Fund for Halifax County. Checks should be made to The Community Foundation, with the Halifax County Fund specified, and mailed to 541 Loyal Street, Danville, VA 24541. Online gifts can be made through www.cfdrr.org. Gifts of stock, life insurance, and personal property can be accepted, as well as will bequests. For more information on The Fund for Halifax County or establishing a charitable fund of any type, contact the Foundation office at 434-793-0884 or visit the web site www.cfdrr.org. DANVILLE, VA- Katherine “Kathy” Milam has been named the new Executive Director of the Community Foundation of the Dan River Region. 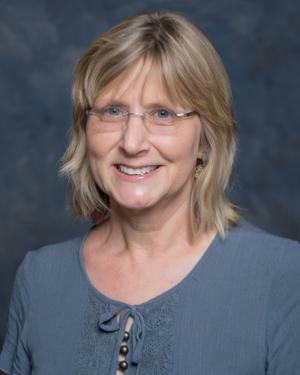 Milam is currently the Executive Director of the Danville Museum of Fine Arts and History and previously served as agency grant writer for the Danville Pittsylvania Community Services. She is a graduate of Emory University and has lived in Danville since 1990 with her husband, Judge Joseph Milam. Kathy is a certified paralegal and certified in nonprofit management through Duke University Continuing Studies. She is active in several long-standing civic organizations, and is past president of the Danville Riverview Rotary, Garden Club of Danville and Danville Concert Association. (Danville, VA) – The Danville/Pittsylvania Academy of Medicine Alliance has begun a scholarship with The Community Foundation of the Dan River Region. The Scholarship will support Danville/Pittsylvania County graduates who are pursuing medical fields of study. The Danville/Pittsylvania Academy of Medicine Alliance began in 1926 and is the third oldest such alliance in the state. For more than 80 years, they have supported the community but the organization is now dissolving and wants to create a permanent scholarship to continue their good work. Alliance members are seeking additional donations to help them reach the minimum to permanently endow the scholarship. Friends and associates can support the Fund by sending donations to The Community Foundation, c/o the Academy of Medicine Alliance Scholarship, 541 Loyal Street, Danville, VA 24541 or made online at www.cfdrr.org. Scholarship applications will be accepted after the fund has been endowed for one year. 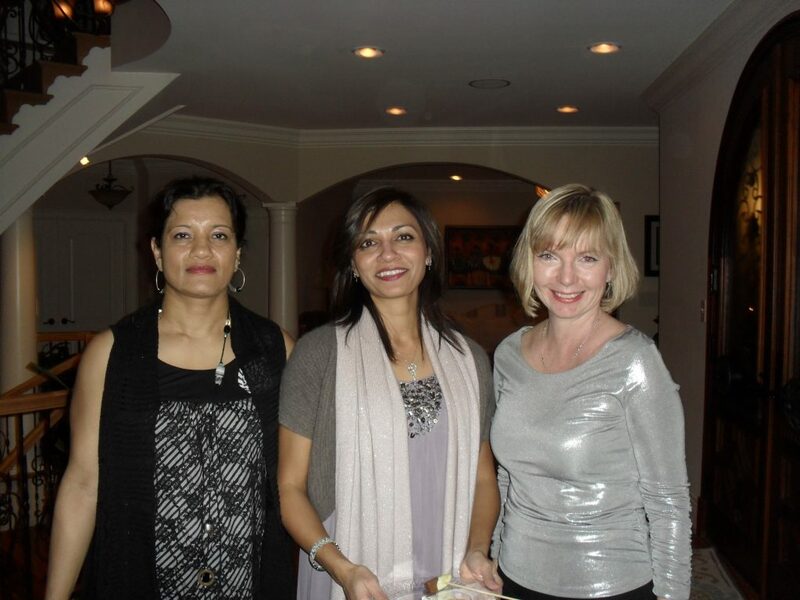 (l.to r.) Meeti Nigam, Dimpal Patel, and Michaela Kotlaba.